When is a car accident a felony in Texas? What is criminally negligent homicide? Each year there are over 3,500 traffic fatalities in Texas. Some of these accidents result in criminal charges. For example, intoxication manslaughter is a case where you have a DWI accident that caused a person’s death. But what if no one is drinking? 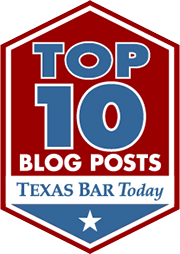 When can dangerous driving that caused a fatality become a felony in Texas? That offense is known as criminally negligent homicide. What is criminally negligent homicide (CNH) in Texas? TEX. PENAL CODE ANN. § 6.03(d) (West 2011). The State must prove: (1) the defendant’s conduct caused the death of an individual; (2) the defendant ought to have been aware that there was a substantial and unjustifiable risk of death from his conduct; (3) the defendant’s failure to perceive the risk constituted a gross deviation from the standard of care an ordinary person would have exercised under like circumstances. Montgomery v. State, 369 S.W.3d 188, 192–93 (Tex. Crim. App.2012). The circumstances are viewed from the standpoint of the actor at the time that the allegedly negligent act occurred. Id. at 193. While that does not specifically mention driving, the CNH is often applied to cases involving auto accidents. For example, a recent Dallas case involved a driver who failed to control his speed, failed to maintain a proper lookout before swerving into another lane, made an unsafe lane change, and failed to take appropriate evasive action. See Churchill vs. State, No. 05-15-00869, Dallas Court of Appeals. The appellate court upheld the factual sufficiency of that CNH conviction, arguing that the trial judge could have concluded those traffic violations alone were enough to constitute a gross deviation from the standard of care that an ordinary person would use. Now go back and look at those offenses listed, they are all minor traffic violations. Basically, an unsafe lane change that the driver didn’t look into the lane he was moving into or consider the traffic in that lane, he just crossed into the HOV lane and caused an accident. The act of cutting into an HOV lane is one Dallas drivers see every day. But how often does that action result in death? And how often do you consider crossing those flimsy barriers yourself to get to your destination faster? It’s not worth it, criminally negligent homicide is a state jail felony offense, with a possible punishment of up to two years in prison. Traffic accident happen, and not every traffic accident, even those that result in death, are a criminal act. However, it doesn’t take much to turn a few benign traffic violations into a CNH charge.